This is an edition of two illuminated prints, both near to three metres wide. 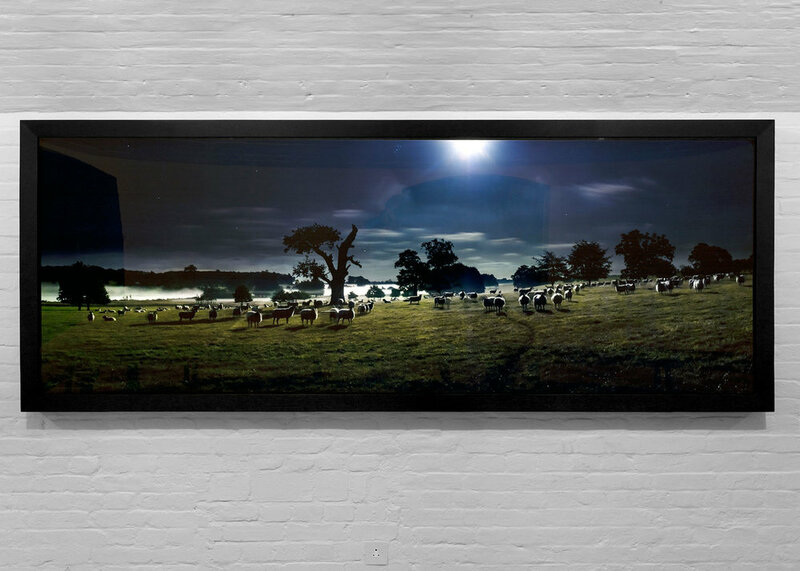 They picture sheep at around midnight and just before the sun rises in an English 'arcadian' landscape. One of the main points of interest in both prints is the thunder struck tree and the sheep's relationship with it. Having seen this tree on what must be hundreds of occasions now I am struck by its power to draw things to it. The illuminated prints were originally made for Sibton Park, a country estate in Suffolk. Both illuminated prints are now displayed at a collector's residence. 'Moon Sheep' is for sale. The illuminated prints have been made in a single edition. They comprise an LED panel which emits light through a translucent print. The print is reverse mounted to perspex. The intention in making the prints was to give the viewer a dreamlike evocation of the english countryside. Both illuminated prints are dimmable to match the environmental lighting.